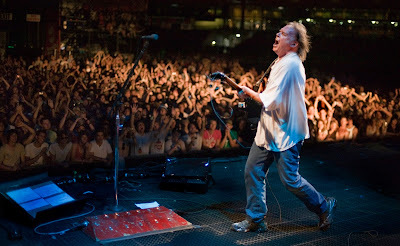 Neil Young and Crazy Horse will reunite next week for their first shows in four years. The rocker and his band last performed at a festival in Colmar, France in August of 2014. Lofgren was a key figure in Young’s early 70s groups and can be heard on the newly-released package, “Roxy - Tonight's The Night Live”, a recording from a series of September 1973 shows at the famous Los Angeles club. The project captures Young performing during the venue’s opening week with the Santa Monica Flyers, the name he gave to the band featured on his sixth album, comprised of Lofgren on piano, Ben Keith on pedal steel guitar, and Crazy Horse members Billy Talbot on bass and Ralph Molina on drums.